QR codes, also known as Quick Response Codes, are an effective way for automotive industry to interact with customers using smartphones. It doesn’t matter whether the customer has an iPhone, an Android phone or a BlackBerry, iPods and iPads. Customers scan the bar code to unlock all sorts of your promotional information. It’s a great mobile marketing tool to help you increase customer traffic and sales. QR Codes are a great way to grab attention and engage your target market. Receive instant feedback through the use of mobile technology. If you capture instant feedback, you can instantly solve the possible problems of your customers. Therefore, preventing their desire to destroy your reputation. Autoxloo propose you wide range of implementation of QR code on your website. First is QR code widget in Make-A-Page 2.0™. With its help you can encode your dealership’s URL, discounts, promotions, phone numbers, images and so on. 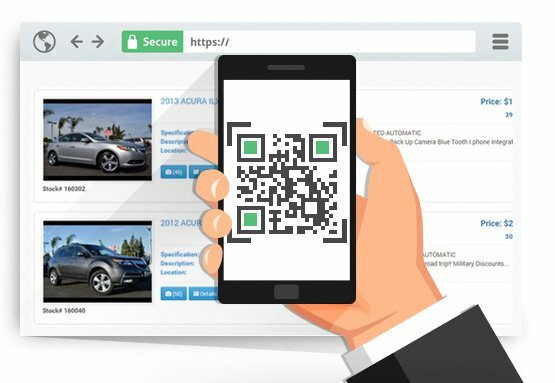 Assign a QR code to every vehicle listing that you advertise. Just place the QR code widget on the vehicle detail page and it will encode URL of each single vehicle. Let people scan your code and reach your landing page full of information about what you are promoting. Your QR code can be promoted by using various promotion media and methods. The ideal methods are personalized emails, blogs, and more importantly social media websites. Second is QR Code system embedded into printable Window Stickers. Each Window Sticker contains QR code with Vehicle Details URL encoded in it. Your customers will scan it and get all the information they need for any car in their mobile phone, and if they’re not ready to buy it right now – they can review this information again afterward. Another great example of using QR codes is our application Quick Upload, which allows you to load vehicles to your smartphone incredibly easy and absolutely free. Just visit our website, scan the QR code and its done. Application management is extremely simple, convenient and intuitive. Place QR codes on the back of business cards for the sales staff – this way they can see a live view of inventory right away if they need it. Add QR code to the last picture of vehicle details page. Put your QR code on a billboard. Incorporate a QR code on signboards in your service department so that people can scan while waiting. Add QR codes on vehicle stickers.